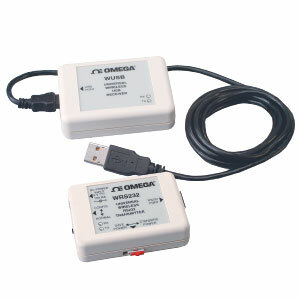 Omega's universal wireless RS232 to USB transceiver interfaces to any RS232 device, and makes it wireless. The wireless transmitter module connects to an RS232 device. The wireless receiver module connects to a PC via USB interface. The PC can communicate with the RS232 device as if it is directly connected. 참고: Because of transmission frequency regulations, this product may only be used in the United States, Canada and Europe.